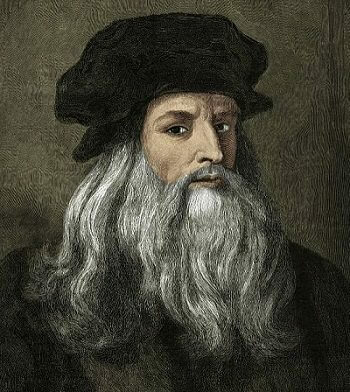 Leonardo da Vinci was a true genius who graced this world with his presence from April 15, 1452 to May 2, 1519. He is among the most influential artists in history, having left a significant legacy not only in the realm of art but in science as well, each discipline informing his mastery of the other. Da Vinci lived in a golden age of creativity among such contemporaries as Raphael and Michaelangelo, and contributed his unique genius to virtually everything he touched. Like Athens in the age of Pericles, Renaissance Italy is a summit in human history. Today, no name better seems to symbolize Renaissance age than Leonardo da Vinci. Leonardo da Vinci was born in a Tuscan hamlet near Vinci. He began a nine-year apprenticeship at the age of 14 to Andrea del Verrocchio, a popular sculptor, painter and goldsmith who was an important figure in the art world of the day. At Verrocchio's busy Florence studio, the young Leonardo likely met such masters as Sandro Botticelli while working beside fellow apprentices Domenico Ghirlandaio, Pietro Perugino and Lorenzo di Credi. Verrocchio, who had learned his craft under the master Donatello, was the officially recognized sculptor for the Medici family, the rulers of Italy during this era. Under Verrocchio's tutelage, da Vinci probably progressed from doing various menial tasks around the studio to mixing paints and preparing surfaces. He would have then graduated to the study and copying of his master's works. Finally, he would have assisted Verrocchio, along with other apprentices, in producing the master's artworks. 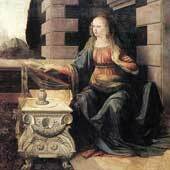 Da Vinci not only developed his skill in drawing, painting and sculpting during his apprenticeship, but through others working in and around the studio, he picked up knowledge in such diverse fields as mechanics, carpentry, metallurgy, architectural drafting and chemistry. In 1473, when he was more than halfway through his studies with Verrocchio, he completed Landscape Drawing for Santa Maria della Neve, a pen and ink depiction of the Arno River valley. It is the earliest work that is clearly attributable to da Vinci. Leonardo da Vinci's drawings would become an essential part of his legacy. Da Vinci sketched prolifically, planning inventions, exploring human anatomy, drawing landscapes, and blocking out plans for paintings such as The Virgin of the Rocks and his sole surviving mural, The Last Supper. Much of his other creative output during his time with Verrocchio was credited to the master of the studio although the paintings were collaborative efforts. Over the years, historians have closely examined such Verrocchio masterpieces as The Baptism of Christ and The Annunciation to weigh in on which specific figures da Vinci was responsible for. In the "Baptism of Christ," which dates to 1475, experts speculate that one of the angels is da Vinci's own work, while in "The Annunciation," produced within the same time period, experts detect the work of the apprentice artist's brush in the angel's wings and the background. In fact, historians x-rayed "The Annunciation" to definitively distinguish between Verrocchio's heavier brush strokes with lead-based paint from da Vinci's lighter, water-based paint strokes. Although a member of the Florence painters' guild as of 1472, the artist continued his studies with Verrocchio as an assistant until 1476. The influences of his master are evident in the remarkable vitality and anatomical correctness of the Leonardo paintings and drawings. After leaving the Verrocchio studio to set up his own, da Vinci began laying the groundwork for his artistic legacy. Like his contemporaries, he focused on religious subjects, but he also took portrait commissions as they came up. Over the next five years or so, he produced several notable paintings, including Madonna of the Carnation, Ginevra de' Benci, Benois Madonna, Adoration of the Magi, and St. Jerome in the Wilderness. The latter two pieces are unfinished. Leonardo da Vinci received a commission to paint his "Adoration of the Magi" from Florence church elders who planned to use it as an altarpiece. This artwork is historically significant by virtue of the innovations da Vinci made that were unique among the art conventions of the 1480s. He centered the Virgin and Christ child in the scene whereas previous artists had placed them to one side. Da Vinci improved on standard practices of perspective by making changes in clarity and color as objects became increasingly distant. Unfortunately, he did not complete the commission due to a better offer from the Duke of Milan to become the resident artist at his court. While in Milan, the artist called upon his varied interests and knowledge to create stage sets and military designs for the Duke as well as paintings. Early in his tenure at court, da Vinci produced his first version of Virgin of the Rocks, a six-foot-tall altarpiece also called the "Madonna of the Rocks." In this painting, which dates to 1483, the artist experiments with blending the edges of objects in indistinct light to create a sort of smoky effect known as sfumato, a technique the artist would continue to develop in his future works. It was perhaps because of his desire to fine-tune this technique that his other surviving painting from his years in Milan, The Last Supper, deteriorated so quickly. The artist used oil-based paint on plaster for this scene of Jesus and his apostles at the table because his customary water-based fresco paints were difficult to blend for the sfumato effect he sought. Within only a few decades, much of the painting had flaked away from the wall in its location at the Santa Maria del Grazie convent. The canvas of Leonardo da Vinci's "Last Supper" that now hangs in the Louvre is, in large part, a reproduction of the failed fresco. Upon the French invasion of Milan, the artist returned home, via Venice and Mantua, to Florence. His reputation preceded him, and he was lauded by old friends and up-and-coming artists captivated with his innovations in art. During this final era of his life, da Vinci completed a greater number of paintings than he had thus far. When he resettled in Florence in 1500, the artist made preliminary progress on his painting, Virgin and Child with Saint Anne," which he would set aside unfinished, not to be completed for another 10 years. Leonardo began creating his most well-known and replicated work, Mona Lisa, a couple of years later when he received a commission from Francesco del Giocondo to paint his wife. The precise date of completion for "Mona Lisa" is still in question, but many historians agree that da Vinci began the masterpiece in 1503. Leonardo da Vinci also accepted a commission for a mural to be installed in the Hall of 500 at Palazzo Vecchio in Florence. The subject was a battle scene at Anghiari, and the painting depicted a tangle of muscular horses and warriors. It was, however, destined to be unfinished. Contemporary master Michelangelo received a commission to paint the Battle of Cascina on the opposite wall, also a work left unfinished. Nothing of da Vinci's battle scene survived, except for a copy by artist Peter Paul Rubens and Leonardo's own preliminary sketches. In approximately the same period, the artist created his second version of the painting, "Virgin of the Rocks," which was likely a commission for installation in a chapel at Milan's church of San Francesco Maggiore. Chief differences between the two versions include color choices, lighting and details of composition. Leonardo returned to Milan in 1506 to accept an official commission for an equestrian statue. Over the course of this seven-year residency in the city, the artist would produce a body of drawings on topics that ranged from human anatomy to botany, plus sketches of weaponry inventions and studies of birds in flight. The latter would lead to his exploratory drawings of human flight machine. All of his drawings during this time reflected da Vinci's interest in how things are put together and how they work. Upon his departure from Milan in 1513, Leonardo spent time in Rome. In October 1515, King Francis I of France recaptured Milan. The monarch had conferred upon him the title of premier architect, artist and mechanic to the king. In 1516, he entered Francis' service, and then journeyed to his last place of residence near the Fontainebleau court of French King Francis I. 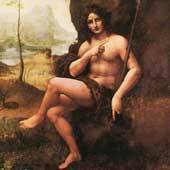 Many historians believe Leonardo completed his final painting, St. John the Baptist,	at his rural home in Cloux, France. This masterwork exhibits his perfection of the sfumato technique. Leonardo died at Clos Lucé, on 2 May 1519 at the age of 67. The cause is generally stated to be recurrent stroke. Francis I had become a close friend. It was recorded that the king held Leonardo's head in his arms as he died, although this story, beloved by the French and portrayed in romantic paintings by Ingres, may be legend rather than fact. 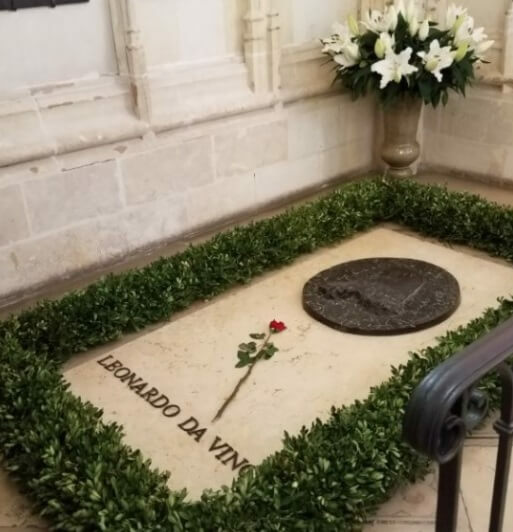 He was buried at Chapel of Saint-Hubert, Amboise, France. Within the artworks created by his own circle of peers, the influence of Leonardo da Vinci's works is readily evident. Raphael and even sometime rival Michaelangelo adopted same of da Vinci's signature techniques to produce similarly active, anatomically realistic figures. His innovative breaks from the artistic standards of his day would guide generations of artists that followed. 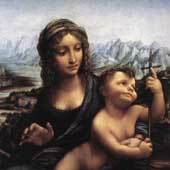 Although da Vinci painted the customary religious scenes of his era, such as the Magi and the Madonna and child, his unique placement of key figures, his signature techniques and his improvements upon perspective were all previously unheard of. In The Last Supper, the way in which he isolated Christ at the epicenter of the scene and made each apostle a separate entity, yet at the same time united them all in the moment, is a stroke of genius that subsequent artists throughout history would strive to replicate. To the present day, art enthusiasts worldwide consider the iconic "Mona Lisa" to be among the greatest paintings of all time. 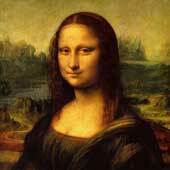 Her image continues to appear on items ranging from T-shirts to refrigerator magnets, and rather than trivializing the import of the masterpiece, this popularity serves to immortalize Leonardo paintings and drawings. They still remain at the forefront of people's hearts and minds centuries after his death. 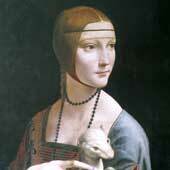 Just like William Shakespeare on literature, and Sigmund Freud on psychology, Leonardo's impact on art is tremendous. Throughout his life, Leonardo da Vinci avoided the intrigues of worldly ambitions and vanity. He was a reserved and withdrawn man, not concerned with glory, and yet absolutely sure of the value of his abilities. Along with a small band of contemporary Renaissance figures, Leonardo da Vinci become the center of a movement of artists that has permanently enriched western culture.